A reader recently posted a photo of the Subway Etiquette poster to the right on the TTIV Facebook page. 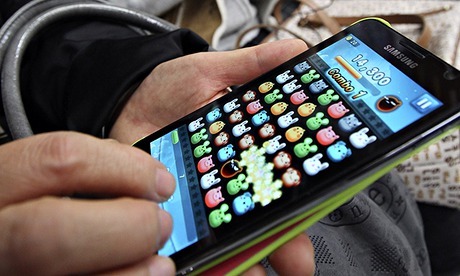 There's a Bad Behavior epidemic out there, and it's harder than Ebola to contain. The poster looks official, doesn't it? After doing a little research, I found that this is one of a series of Subway Etiquette posters produced by the artist Jay Shells. I hadn't heard of him before, but this project of his has earned my respect. He's on our team. In my view, this position on clipping goes beyond etiquette. It's a RULE, and as you know, THERE ARE RULES! In an earlier post, I shared my view of several subway RULES. We all can agree on nail clipping, here are a few new ones. Pole Hogging. Or Hugging. This is the act of leaning on a subway pole during rush hour. When subways are crowded, people stand around the pole and hold it. Courteous riders will hold the pole at levels commensurate with their heights. The tall guys hold the pole high up, leaving the lower pole for the vertically challenged. 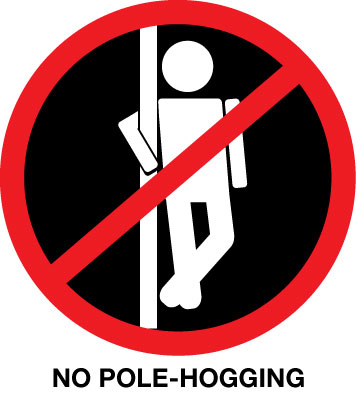 The Pole Hogger, however, does not care about you, his fellow commuter. The Pole Hogger is a narcissist. The train is crowded, people are looking for a place to stand, and this person pretends not to notice that many people need a spot to stand and hold on. I am usually up for this passive-aggressive game with the Pole Hogger. First, I make a judgment call as to whether the Pole Hogger is a dangerous jerk or just a regular jerk. If the latter, I will walk right up to said pole, and wrap my hand around it until he moves off the pole. If he doesn't, I shift my hand so he can feel my knuckles. Usually, that sends the message and the offender backs off. But sometimes, he's super passive-aggressive and still won't move. So, there we'll both stand, equally passive-aggressive. Him with knuckles digging into his back, and me with back digging into my knuckles. I guess I'm just as passive-aggressive, but at least I use my powers for good, not evil. know it is hard to understand, tough to fathom, challenging to grasp, but I don't want to hear your Metallica. I don't want to hear your Vanilla Ice. I don't want to hear your Lawrence Welk. I don't want to hear your Slim Whitman. I also don't want to hear your Candy Crush (I don't want invitations to play the game either, but that's another story), Minecraft, Space Invaders, Tetris, Pac-Man, or Pong. Turn down the sound of your speakers. Or your headphones. Jeez, you're gonna go deaf listening to that. I am officially my father. Let people off the train before you board. This is a tough one. People are anxious, maybe they've waited and watched three trains go by and haven't been able to get on one. They're gonna push. They're gonna shove. But you know what? When I'm on the train getting off, I'm not thinking about their psychic distress. I'm thinking about exiting the train station. When they block my way, it's a bit like football. We are all well within our rights to drop into a tuck position and gently bash our way like a 260 lb (117.934 kg, for those who prefer metric measures) running back through a boarding throng. But gently. If these things happen to you, or if you have other RULES you'd like to add to the list, don't get angry when it happens. OK, get angry, but be sure to TELL ME about it, at thetrain.invain.829@gmail.com. 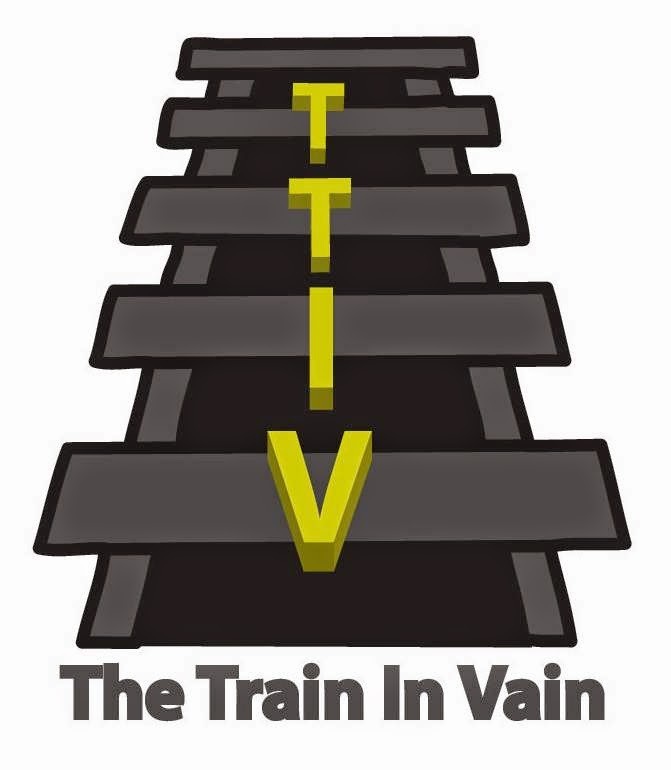 You can also post about it on The Train In Vain Facebook page or on Twitter with hashtag #TTIV. No eating or drinking. All food / beverage items must be enclosed. Tough to ban eating and drinking. I agree with enclosing the food and beverages.